Barrel - 11/2" x 1/4", 90 degrees to clip. 1 line of repeating copy or personalization on barrel. (Gray color fill included on silver finish only.) 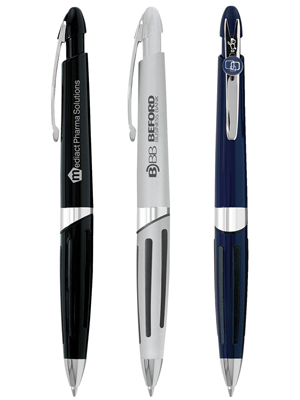 Add $.60 per pen for second location of repeating copy or personalization (up to 25 characters). Add $8.25 to your choice of any Attriant pen. Navy, Black, NEW! Silver, NEW! Blue. Weight is 8 lbs. (approx.) @ 100 per carton. Click here for shipping information, 2-day service at ground rates. BIC Air Express 1 Day Air.